Segovia Unit is a minimum security prison located in Edinburg Texas, part of Hidalgo County. 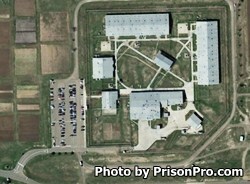 Segovia Unit has a maximum capacity of 1,224 male offenders and is located on 300 acres it shares with the Lopez Unit. This facility is sometimes referred to as the "Lopez/Segovia Complex." The unit is comprised of twenty acres with a perimeter consisting of double razor wire fences and electronic detection systems. Additional security is provided by a twenty four hour perimeter patrol. The Segovia Unit is considered a pre-release facility, which helps transition inmates for release by helping them meet parole requirements and prepare for their upcoming release. In most instances, inmates at Segovia Unit are within two years of their release, parole date, or sentence expiration. Inmate housing consists of two housing structures with three 204 bed dormitories in each. Each 204 bed dormitory is divided into 68 bed sections with roving officers and supervisors in a fixed booth who continually monitor the inmates. Inmates at Segovia Unit are encouraged to participate in educational opportunities that include literacy courses, adult basic education classes, and can even earn their GED during their incarceration. Additional courses provided include substance abuse education, various support groups, life skills classes, cognitive intervention, and the CHANGES pre-release course. Select inmates at Segovia Unit can work in the laundry department, in facility maintenance, and may provide services for the Texas Department of Transportation, the Texas Department of Parks and Wildlife, local food banks and the Habitat for Humanity. Additional work details include working in a unit garden, and in various agricultural operations. Visitation for inmates housed at the Segovia Unit occurs from 8am to 5pm on Saturdays and Sundays. Normal visits are two hours in duration. All visits terminate at 5pm, so if you arrive at 4pm you will not have a two hour visit. Inmates are only allowed a single visit each weekend. Always call prior to visiting to ensure your inmate is still located at the unit and that visitation has not been canceled. Paper currency is prohibited from entering into the facility, however visitors are permitted to bring a small clear Ziploc bag with up to twenty dollars in quarters to purchase items from the vending machines.